Have you ever imagined designing your own high-quality rugs; customised to your desire and fancy? Well now you can with Rug Couture, a premier luxury custom rug company with over 20 years experience in designing and customising the perfect rug for your home. I was much impressed with the hundreds of rug designs available at Rug Couture and you'll be too. From funky contemporary patterns to plain traditional designs, you will definitely find one (or maybe two!) rug design that will definitely suit any home, big or small. At Rug Couture, you will enjoy the liberty of choosing a rug and customising it to your preferred colour combination and size. Have fun choosing from 10,000 colours to add to your custom palette where you can mix and match your favourite shades to come up with your unique rug design. Once you're totally happy with your creation, your custom rug will be then hand made by a team of skilled craftsmen in approximately 6 weeks; a long but very worthwhile wait to finally own the beautiful custom rug you've always wanted! 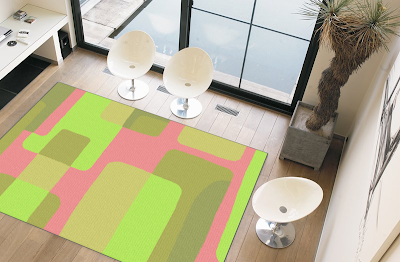 I had a lot of fun designing my own rug with my current favourite colours pink and lime green. What a lovely combination and after seeing the finished creation; I'd really like to have this one here for my home-office. What say you? :) :) :) Monica FC1! :-$ :-$ :-$ :-$ My last RM PB Mon! oh mine oso last RM PB! no more edi.. I rejected .. how lah? wht abt yr LW Mariuca? I just bid on 2 at LW, now waiting for approval. You joined this new program edi or not? I sent u email but dunno if it went through. no lah i didnt receive yr email! what's that? Ah usually the payment cycle is on the 10th. Last month I got paid edi for June, on the 10th but not much la. I dunno…. But u mentioned Andy is working with CL now right? Hopefully we can get back our CL asap! Ha ha u are the first one Ane and I now have echo at all three blogs woot! Am I the 2nd to comment onyour ECHO, marzie???? LMAO!! I haven't checked out my blogs yet.. go echo already or not??? LMAO!!! U are the second to comment using ECHO here Shemah hahahah! Welcome to ECHO hohoho!! Hahahhahah lemme check MSE, sure got echo edi! Monica! He he! The new echo for JS kit, if u see ur comment box, u will see that is is now ECHO, check it out! thats look nice Marzie.. cute combination of colors too..